Our newest contributor, Kayci, joins us again with her best working mom life hacks. Read on for ways to find out how to make life easier as a working mom. When my son was a baby I was a stay at home mom. I grew vegetables, cooked every meal from scratch, kept a clean house, and did all kinds of craft projects. I mean, he was an easy baby, so take that for what it’s worth. But still, I prided myself on staying top of all of this and never forgetting anyone’s birthday and sending thank you cards in a way that would make Emily Post proud. I really had it all together. And then circumstances changed, and I returned to the workforce. And then I realized I did not have it all together. Not at all. Over the past six years I have gone through a lot of trial and error, a lot of beating myself up, and a lot of compromises to make it work while, well, working. Last year I had a baby girl (note: NOT an easy baby) and now I’m in the thick of it with two kids, a household to run, and a full-time job. I’ve created some working mom life hacks and found some ways to make life easier as a working mom; some are minor, but all have a major impact. 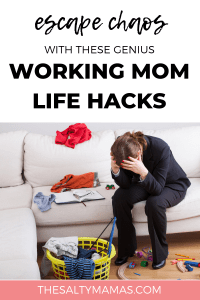 So whether you’re looking for ways to make being a working mom easier, or just need a little encouragement, you’ll find something just for you in this list of working mom life hacks. This post contains affiliate links. You can read more in our disclosures. Thank you for supporting The Salty Mamas! The most mentally taxing thing for me, as a working mom, is keeping track of everyone’s schedules and who needs what (and when). It seems like every other day my son’s school has a spirit day or a presentation or a project due. My daughter’s daycare supplies require daily re-stocking. And I’m embarrassed to admit how many times I’ve forgotten a 7am meeting or showed up to a very important presentation in a laundry-day fiasco of an outfit because I failed to plan ahead for it. 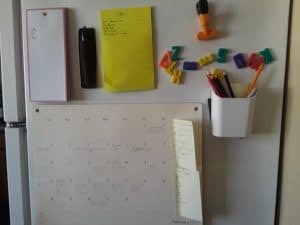 After trying every e-calendar and organizational app I could find, I finally went back to basics and began tracking these things the old-fashioned way, with a giant paper calendar and hand-written notes. Applying the tools I use at work every day, this organization system developed into my Command Center. It has made an enormous difference in keeping our days running smoothly. My husband, my son, and I have a handy reference for everything we need and everywhere we need to be without me having to fight through dozens of apps or keeping it all in my head. With that mental load lifted I no longer feel like all my energy is going toward just REMEMBERING things. Working Mom Life Hack #2: Make a Plan. Having things run smoothly every day hinges on a tight schedule and well-planned routine. Before my daughter was born my husband and I had to have some tough conversations about how we would manage drop-off and pick-up for both her and her big brother at two different locations. Ultimately, we decided that he would do drop offs and most of the morning routine, shifting his work schedule to a later start and later end than previously. In turn, I would go into work earlier and get off earlier than I used to and do the pick ups and evening chores. Having it outlined this way minimizes tiffs over who needs to give the baby her morning bottle or start dinner; we each have our “assigned” tasks and, while we’re happy to help each other out when needed, we know how to plan for what needs to get done. So we have our routine down pat and things work out perfectly, when everything goes according to plan. Which, of course, it almost never does. Working Mom Life Hack #3: Make Another Plan. Kids get sick. Often when you have a big presentation at work. More often when both parents do. Also there are out-of-town business trips and early morning meetings and staying late at the office to finish a project. Flexibility is key, but even that doesn’t work without having some options ready. We are very, very fortunate to have my sister close by (shout out to Salty Jaymi!). When school is closed for any one of a thousand reasons that my work does not accommodate, I call my sister. When the baby is too sick for daycare but not sick enough for me to call in to work, I call my sister. I am very aware of how fortunate we are to have her available and willing to help. If you have any family or close friends who either don’t work or have a different schedule than you, reach out to them and see if they’d mind being your back up sitter. If not, it’s worth your time upfront to look into backup babysitter services that exist for exactly these scenarios. My city has a Facebook group dedicated to finding childcare services in my area. Odds are, yours does, too. You can also use Yelp, your primary daycare provider, or recommendations from friends to find somebody you can be ready to call when your perfect plans go awry. Working Mom Life Hack #4: Make Mealtimes Easier. Evenings are not easy for working moms (or SAHMs, for that matter). Doing daycare and school pickup, homework, and feeding/hovering over my very active ten-month old left me with very little time to meal prep or make homemade dinners. I often resorted to takeout or pre-packaged dinners or ordering in pizza. And that is 100% fine if that’s what gets you through, no judgment there. But I actually like to cook and got tired of being too overwhelmed to do it. I recently discovered the most amazing (free!) meal prep app called Mealime. It works like those home-delivery meal services but you do the grocery shopping yourself, which I find saves a lot of money. Every Saturday I go through the app and select which meals I want for the week. The app generates a grocery list with everything I need, categorized into which section of the grocery store I’ll find it all in. You can export the list to Amazon Fresh and have everything delivered; I prefer to do the shopping myself, but this could be a great feature if you dread that errand. I list the weekly menu on a post-it note and stick it to the command center. When it’s time to cook, I look at the post-it to see what’s on deck, then open the app. The cooking mode instructions tell you what to do step-by-step, taking the guesswork out of making sure everything’s done at the same time. My family is not an easy one to meal plan for, wtih dietary restrictions, health goals, picky eaters, and limited time to devote to cooking. This app not only has lots of options (keto, paleo, gluten free!) and tons of flexibility. With a few clicks, you’ll have a plan tailored to your family’s unique needs. Working Mom Life Hack #5: Get a Giant Purse. Yes, I am officially recommending you do some retail therapy here. I’m sure you already have a big purse that holds your daily essentials. Get a bigger one. If you can, splurge on one that you love because this is going to be your lifeline. A year ago the Kate Spade website was having a huge sale. Now, I love–LOVE–Kate Spade but these bags are usually out of my price range. Even on sale, they fell into the “I really shouldn’t” category of my price range. Yet when I saw a giant tote bag in a neutral color I decided to, in the words of Tom and Donna, “Treat Yo Self!”. Wallet, keys, phone, tablet, glasses, etc. (obviously). Makeup for days you end up finishing getting ready in the office bathroom because holy heck, mornings are hard. A portfolio/notebook/file folder for work meetings that run straight into school pickup. Phone charging cables and portable power bank. A diaper and small package of wet wipes, if you have little ones who aren’t yet potty trained, because sometimes you have to stop by Target on the way home and I am not making the mistake of not having an emergency diaper on hand…again. Snacks. For you and your kids. Something that can keep kids entertained in a pinch because last-minute doctor appointments, post office stops, and parent-teacher conferences are a fact of life. For me this means a board book for the baby and, honestly, headphones so my son can watch videos in the waiting room if it comes to that (it usually comes to that). I use a purse organizer to keep my smaller items easy to find. This is also handy for switching between purses when you go somewhere fancy and don’t want to lug your big ol’ mom tote with you. Working Mom Life Hack #6. Give up. Give up on being perfect. Give up on doing everything you feel pressured to do. Give up on keeping up with things you just don’t really care about. For me, the hardest-learned lesson in working-momhood is that not all things are worth my time or—that even more scarce resource—my energy. I used to make excuses for why we had takeout more often than I’d care to admit, for why my son’s Halloween costume came from Target, for why I never went to the gym any more. Because yes, there probably are technically enough hours in the day to get all of these things done. But that leaves no time to build a Lego set with my seven-year-old, sing silly songs with my baby while she’s still tiny, have a long conversation with my husband, or unwind at the end of a hard day. And ultimately, for me, that’s not worth it. So I learned to let go and to only focus on the things that are important to me. To borrow a phrase from the now-ubiquitous Marie Kondo, find out what in your life sparks joy. And then focus on that. Maybe “joy” is a bit too optimistic when it comes to all the things you really do have to get done (joy is nearly never sparked by vacuuming or grocery shopping), but figure out what, exactly, you need in order to be happy. How clean does your house need to be kept for you to feel good being there? How often do you actually need/want to cook a home-made meal? How many days are you comfortable staying late at the office? What do you need to do to keep yourself sane? Sometimes the bare minimum–the least you can do and still feel like you’re where you want to be–is enough. Sometimes it has to be enough, because sacrificing the things that DO spark joy is just not worth it. And cut yourself some slack, mama. You’re doing better than you think.